Free OESP Membership! – Yes, free. For a limited time only, OESP is offering website visitors a free, six-month trial membership. Visit the site, sign up, and start experiencing the benefits of OESP membership. Industry News – Stay informed about the latest industry news impacting you and your business. Events – Check out OESP’s interactive calendar of events and sign up for educational and networking opportunities in your area. Access information about seminars, chapter meetings, the OESP Road Show, the Dave Nelsen Scholarship Golf Tournament, the Oil Heat Retreat, and Care to Ride. Education – OESP offers a range of managerial and technical courses throughout the year to match every learning style. Visit their Online Learning Center for education that works around your schedule. Enhance your skills through the Train-the-Trainer Program. Stay on the cutting edge with the Home Comfort Specialist Academy. Attend OESP’s trade show and regional shows. And sign up for their weekly energy-focused newsletter, The Advantage. 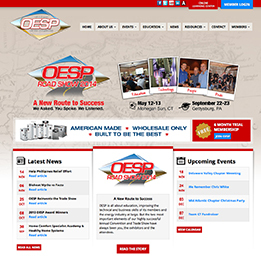 Resources – OESP’s new website connects you with valuable information, quick links, and a Buyers Guide that showcases innovative products that will help you on the job.